Outsiders who expect the little Suffolk market towns all to be full of 15th century cottages and very little else, are often surprised by how industrial most of them are. This, of course, is because the 19th century railways stretched out their tentacles, and reached most places. A surprising number of these lines survive today, a great advantage to the church-visiting cyclist . Local train operator National Express East Anglia positively encourages cycling, and you can take your bike on any train in East Anglia for free..
Of course, the little branch spurs have mostly been lost, like that from Mellis to Eye, and the one from Wickham Market to Framlingham. The only main lines that Suffolk gave up were those from Sudbury to Cambridge and Thetford, part of a direct link between Colchester and the north of England. Norfolk's railways, on the other hand, were stripped away like bothersome varicose veins. 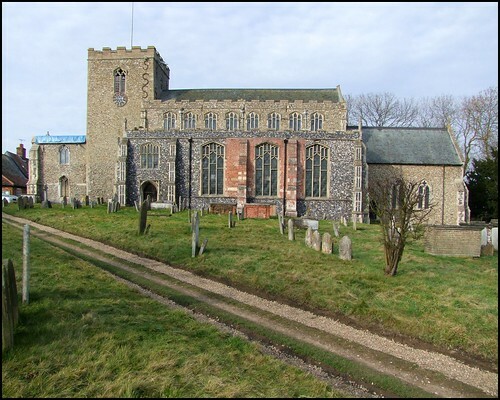 Debenham, then, is quite unusual, because it is the largest settlement in East Anglia that the Victorian railways never reached. There was a plan during the 20th century for trains to serve it, as we shall see.But Victorian industry never troubled it much, except for a brick factory, and because of this it has a quite different character to other Suffolk places of its size. It is softer, more pastoral, with elegant little shops lining its high street.This isn't a place many people pass through, unless on the backroad from Ipswich to Eye. It is more a place that tourists know to be beautiful, and local villages look to for amenities - the Co-op, the school, the sports centre. White's Suffolk Gazeteer of 1844 found about 3,500 people living in and around it, and I do not suppose that there are many more than this today. St Mary Magdalene is a large, surprisingly urban church. But why not? For in larger places, it is the town that has become more urbanised, not the church. Most towns were once like this. It is set back on a rise above the old market place, although most people will approach it from the west, beside the little parish hall on the high street. Here, the first thing to admire is Suffolk's grandest galilee porch, with its former chapel above. These western porches are most unusual: there is a similar one at Bottisham in Cambridgeshire, and one on the round tower at Mutford. The western extension at Lakenheath was never a porch at all. So here is an experience to savour: you enter the church through a series of unfolding spaces, so that finally opening the double west doors into the nave comes as a surprise. You step out from beneath the recently restored tower. The porches and aisles clustering beneath it create the sense of a cruciform building, which of course it isn't. It is certainly a very old tower, though, with evidence of Norman and even Saxon work on the lower reaches. The upper decorated stage is 14th century, and looks rather unusual for Suffolk, the bell openings being so close to the battlements. This is because it had to be truncated after being struck by lightning in the 17th century. Perhaps its squatness is rather charming. The ring of 8 bells is considered one of the most mellow in the county, and the space beneath them, has several of those boards recording remarkable feats of bell-ringing. You step into a big church made gorgeous by the brick patterning of the floor, the fruit of Debenham's one major 19th Century industry. Red and white bricks are laid in a diamond pattern, with small floral tiles in the points of the diamonds. It is surely one of the most beautiful church floors in Suffolk, and a sign that, although the inside of this building is almost entirely 19th Century in content and character, this interior is by no means an anonymous one. Grumpy old Cautley pottered about looking for medieval survivals, but this is an interior to enjoy as a whole; as with so many urban churches, the 19th century work contributes to a sense of continuity rather than disrupting it. Badges that his disciples all may bear. As best may shew our vests of Charitie. The Sceptre reed presented him in scorn. Display, true ensigns for a Christians tomb. Free from the Censure of the good and wise. This is fascinating, because Simpson grew up in the white heat of Puritan theology, and lived through a time when the world was turned upside down by the madness of Oliver Cromwell and his puritan theocracy. There was a great rejection of the spirit of puritanism in the years after the Restoration. But almost forty years after the end of the Commonwealth, after the coup by the merchant classes which deposed James II and replaced him with William III, John Simpson desired to express in his inscription puritan sentiments transformed and made gentle by the years since, the realism and charity of a man who has lived through much, and has come to realise what is important. No fundamentalist, he left his parishioners with a guide for living; a reminder of how they should live their lives, but also perhaps a warning against the vanity of those who would rule over them. It is as if it is an expression of a second settlement, a bedding down of theology after the long years of discord and extremism. Good and wise indeed. Two other former Debenham citizens lie in the chancel. Sir Charles Framlingham and his wife appear to have been woken suddenly from sleep, their eyes wide and staring, as if terror-struck. Her ruff is fabulous. Their recumbent effigies lie on a rather battered tombchest, its kneeling figures doubtless removed by enthusiastic parishioners of John Simpson's predecessors in the middle of the 17th Century, who misinterpreted them as Saints. What little coloured glass this big church has is up in the chancel, all of it fairly good. The Victorians placed triple lancets in the east, rather than the more familiar large-scale Perp revival, and this creates a sense of intimacy. The crucifixion in the east window is sombre and detailed, but best of all are the figures of St Columba and the Blessed Virgin at the Annunciation that remember the Dove family on the south side. I'm usually a fan of the work of Rowland and Surinder Warboys' work, but the 1992 abstract in a north side window is a little insipid for my taste. At the east end of the south aisle, the apparatus for a chantry altar is still in place, with a piscina, and the rood loft stairs opening off of it rather than in the nave or chancel. At the east end of the north aisle is a curiosity, a piscina made up of odds and ends rescued from elsewhere, including a fine 13th Century Bishop's head. The font is a rather battered late medieval example, with an elegant 17th Century cover. Above the chancel arch, the rood beam is still in place. Like so many survivors, its bulk must have made the 16th century reformers wary of removing it, lest the church fall down without it. Just to the north of Debenham, the remarkable Mid-Suffolk Light Railway ran on its way from Haughley Junction to Laxfield (it was planned to reach Halesworth, but this never materialised). This early 20th century enterprise was the setting for John Hadfield's novel Love on a Branch Line, and is still remembered fondly by older Suffolkers. At the time of the First World War, a spur was built from Kenton Junction to a field just north of Debenham. It was an expensive and hare-brained extension, for permission to carry passengers along this stretch was never obtained, and nor was the last stretch into Debenham itself ever built. So, Debenham fended off the iron giants to the very last, and they will never come now. Use of the spur for goods traffic was discontinued after a few short years, and the rails were removed. The cost of this spur contributed ultimately to the Middy's demise. Although very little evidence of this company's railway survives today, there are substantial remains of a bridge and embankment of the Kenton-to-Debenham spur on the road to Aspall, about a mile north of the church. The traffic rushes by, but to clamber up on this overgrown ridge is to consort with ghosts.